Many of the older Minneapolis homes are full of charm but lack the open spaces that families appreciate today. Bannochie Builders, Inc. has transformed cramped kitchen spaces by removing walls or adding a room addition. Sometimes just streamlining the layout and updating cabinets, flooring, lighting and countertops can improve the function and feel like you have more space. The kitchen is the heart of the home. It is a place where families and friends like to gather to enjoy food and each other’s company. As licensed remodeling contractors we can see the potential in any room. We specialize in quality construction and remodeling services that add enjoyment and value to your home. Our designers will collaborate with you to design a kitchen that fits your needs perfectly and stays true to the home’s aesthetics. Doing a kitchen renovation that adds value takes a professional with hands-on experience. Bannochie Builders Inc. has a long list of satisfied clients who will vouch for our expertise in Kitchen Improvement Services. Bannochie Builders, Inc. has 20 years of experience as Licensed Remodeling Contractors who specialize in Quality Construction and Remodeling. Our expert renovation team has transformed many outdated Minneapolis, MN kitchens into dream kitchens. 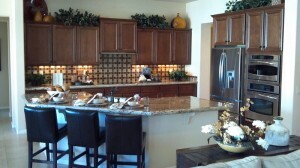 Contact us today for a Free Estimate on Kitchen Improvement Services. This entry was posted	on Thursday, January 8th, 2015 at 9:16 pm	and is filed under Kitchen Remodeling. You can follow any responses to this entry through the RSS 2.0 feed. You can leave a response, or trackback from your own site.